Even when the sky is blue or the occasion is happy, low mood can arise at anytime. A fleeting memory, a sad song, a fragrance that reminds one of a loss; all of these can cause low mood despite the apparent positive conditions that may be present in one's life. Those who are vulnerable to depression are often more sensitive to changes in the underlying tone of their feelings and this makes it easier for low mood to become a trigger for negative thinking and a possible relapse of depression. "Cognitive Reactivity (CR) refers to the degree to which a mild dysphoric state reactivates negative thinking patterns, and it has been found to play a key causal role in depressive relapse." Those who have suffered depression in the past often have a higher Cognitive Reactivity (CR) to changes in mood. In fact, mood is directly related to the types of thoughts that arise, so if rumination is an established pattern it can be a difficult habit to challenge. For example, thoughts of isolation; thoughts with a particularly negative bias; thoughts that are self-critical; and thoughts of past situations in which one felt sad can all arise quickly and more easily, when a low mood prevails. Conversely, whilst in a positive mood, thoughts of friends; thoughts of happy times; thoughts of positive self worth; thoughts of self acceptance and empathy towards others tend to prevail, and can again arise more easily. Mindfulness has been found to be an effective tool to alter mood in a positive sense and to halt the downward spiral assoicated with low mood. 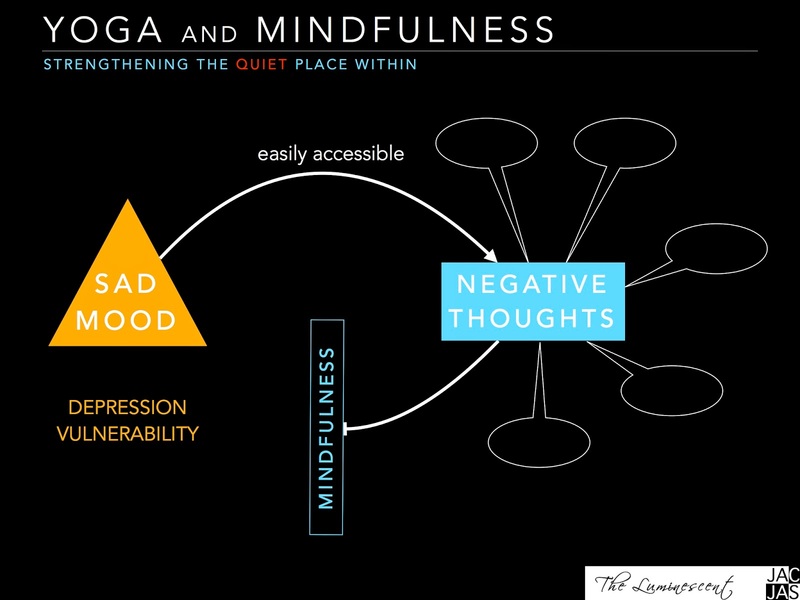 When using Mindfulness to alter mood, one is not attempting to stop the ruminating mind but rather learning to interrupt the IDENTIFICATION WITH THOUGHTS. It is an exercise in noticing the transient and fleeting occurrences of thoughts so as to cut through the cycle of rumination and return to the immediacy of sensation. I invite you to practise this Mindful Minute Meditation with a particular emphasis on noticing the UNDERLYING MOOD and THOUGHTS as they arise. Did you notice the underlying mood? What types of thoughts bubbled up? Were you able to return to the present environment and focus on WATCHING and LISTENING? Were you easily distracted by the persistence of particular thoughts? VISION, TASTE and SOUND can be particularly effective objects of focus in meditation when in a low mood.